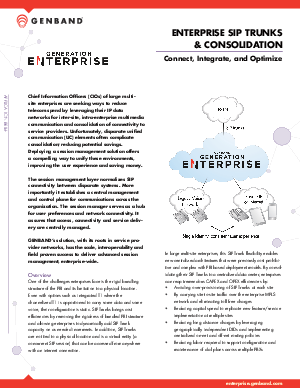 CIOs of large multi-site enterprises effective ways to reduce telecom spend by leveraging their IP data networks for inter-site, intra-enterprise multimedia communication and consolidation of connectivity to service providers. Unfortunately, disparate unified communication (UC) elements often complicate consolidation; reducing potential savings. Deploying a session management solution offers a compelling way to unify these environments, improving the user experience and saving money.GENBAND’s solution, with its roots in service provider networks, has the scale, interoperability and field proven success to deliver advanced session management, enterprise-wide.